One of the biggest fashion trends of the season is not hard to miss. It’s neon! Reminiscent of the glowing 80s, the bright colors are getting official fashion endorsements across the media. E! News’ Giuliana Rancic was amongst the first to announce the style trend, as the fashion expert told viewers bright colors, particularly neon, would be the color to wear this summer. Bright colors aren’t just for the catwalk, neon has made its way onto fitness apparel, too. Even running shoes like Brooks are brighter that ever with plenty of unconventional shades and designs. It’s hard to miss the neon when walking into a sports store this season. Brands like Nike, UnderArmor, and Jillian Michaels‘ K-Swiss collection have fused neon into their shorts, sports bras, shirts, tanks, and even socks! Neon colors aren’t just the hottest summer fashion trend, it makes your outdoor workouts and runs even safer. Wearing a neon yellow or green workout shirt while running at night can reflect light. This helps drivers avoid hitting a runner or cyclist. Another benefit of wearing neon is having a natural energy booster because colors can influence moods. Bright and fun colors can make people feel peppy and energized, and who doesn’t like to feel energized while they are working out? 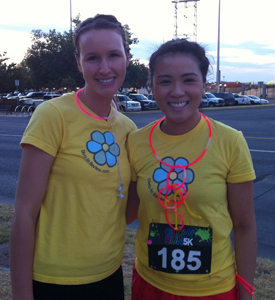 The biggest infusion of neon we’ve seen all summer is at the Glow Run 5k, a running event that took place in Omaha, Kansas City, and this past weekend in Wichita at which team DIR participated. The more than 4,000 runners lit up the night in neon-colored socks, shirts, body paint, and thousands of neon glow sticks. 1. Wear neon from head to toe. Try wearing a neon shirt or tank and neon running shorts or yoga pants to grab attention. 2. Complement with neon, don’t saturate. Some people are scared to try anything with neon colors because it is too bold. The solution to the problem is to accessorize! 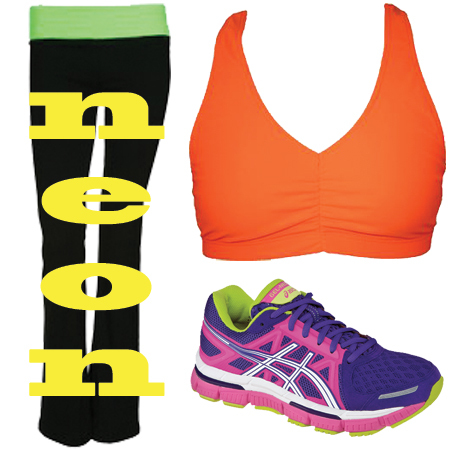 Wear something small that has neon infused in it like shoes or carry around a neon gym bag. 3. Layer with neon. Rock one of those gym-to-street looks with a neon tank under a slouchy white T-shirt and black yoga pants to add a little pop to an otherwise ordinary outfit. Samantha Bandasack is a junior at Wichita State University studying marketing and communications. She enjoys staying healthy by practicing hot yoga, weight lifting, and eating plenty of spinach so she can still have her favorite cookies.